Erasmus University Thesis Repository: Civil Society Participation in the Peace Recovery and Development Plan (PRDP) in Gulu District of Northern Uganda: A Prospective Study to Analyse the Contribution of Civil Society Organisations. Civil Society Participation in the Peace Recovery and Development Plan (PRDP) in Gulu District of Northern Uganda: A Prospective Study to Analyse the Contribution of Civil Society Organisations. This paper presents analysis of issues related to civil society (CS) participation in the Peace Recovery and Development Plan (PRDP) for Northern Uganda as conceptualised by the government of Uganda (GoU). This was a prospective study considering that PRDP implementation started in July 2009and will be completed in 2011. Gulu District was selected because it is one of the districts that were largely affected by the Lord‟s Resistance Amy (LRA) conflict and it is assumed that CS activities have been at the centre of interventions to deal with the conflict and recovery. The study explores different ways in which civil society organisations (CSOs) have participated in the process of PRDP and analyses the underlying reasons behind CS participation in PRDP. I rely on Arnstein's (1969) ladder of participation to analyse the different aspects of CS participation. This paper argues that CS participation in PRDP is narrow, greatly manipulated and controlled by the government and highly influenced by the major foreign donors‟ agendas it may not influence the process to have empowered communities in northern Uganda. -- Relevance to Development Studies -- Globally, CS participation in the development process is considered part and parcel of the development processes by different actors as noted in Stiles (2000:32). There are various discussions of the concept CS about what it means or does not mean as Burnell (2009:69). The role of CS in development process is another contested arena as this study will show. 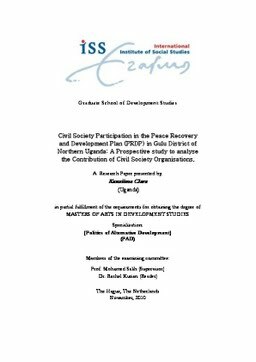 This study shall con-tribute to the current debates about participation of CSOs in the current main framework of development using PRDP in Gulu district of Uganda as a case study.